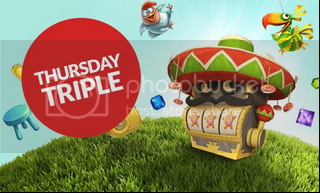 Free spins for every day of the weekend – that is what Thursday Triple is all about. Deposit and play during Thursday and you’ll get free spins on Friday, Saturday and Sunday. That is Guts kind of weekend! Deposit €20-49 (£20-49, $20-49) on Thursday 00.01 – 23.59CET, wager the amount and you get 10 free spins per day, 30 in total! Deposit €50 (£50, $50) on Thursday 00.01 – 23.59CET, wager the amount and you get 20 free spins per day, 60 in total! The free spins will be credited Friday, Saturday and Sunday at 11.00CET and are valid until 23.59CET on Sunday. This offer cannot be claimed with the welcome free spin offer. Standard bonus terms apply, standard terms and conditions apply.